Endoscopy is often used along with ultrasound, digital xray and lab blood work analysis to help determine a diagnosis and treatment plan for your pet. With our state-of-the-art endoscopy equipment, we are fully equipped to perform complete endoscopic evaluation of the gastrointestinal tract. 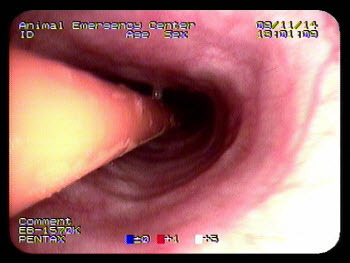 Using endoscopy, we can collect biopsies from the stomach, duodenum, ileum, and colon and remove foreign bodies from the stomach and esophagus.